What is a focus wall? A focus wall is a bulletin board or tri-fold display that shows specific skills you are currently focusing on. They are mainly used for reading and language arts but can but used for any subject. I wish I had the wall space to include all subjects. If you don’t have wall space, create a tri-fold display with the same concepts to display when needed. Here is what the focus wall in my classroom looks like. I didn’t have a huge space to work with so I tried to make it as informational as possible with what I had to work with. I’ll go into detail about what I’ve included on my wall in a minute. What is the purpose of a focus wall and what are its benefits? 1. Focus walls keep your classroom up-to-date on the concepts that your students are learning about. All the academic vocabulary they are learning that week is displayed for them to see at all times. Most focus walls are changed on a weekly or bi-weekly basis. 2. Focus walls are beneficial for students AND the teacher. All of the information you are teaching/working on is in one place. – Student benefits: If students have a question about a strategy they can simply walk over the focus wall and take a look to help them figure out the answer. They are great for developing student independence. Mine is displayed right behind my small group table so students can easily see everything we are working on. I did display vocabulary and spelling word cards to pull when doing small groups to make it interactive. Teacher benefits: Every skill you are teaching that week is there for you to see. Ex. I display my weekly vocabulary and spelling words. Instead of keeping up with a list, I can easily look over at the wall to see what words we need to work on. Use it as a teaching tool, I refer to our focus wall daily. 3. Everything your learning is on display. I am not required to display objectives in my classroom. I’m not even required to have a focus wall but I have gotten several compliments from my administrators and even parents when they walk into my classroom because they know exactly what we are working on. What do I include on a focus wall? I use small pocket charts and clear plastic page protectors to display my information. You can click here to purchase them on Amazon (affiliate link). 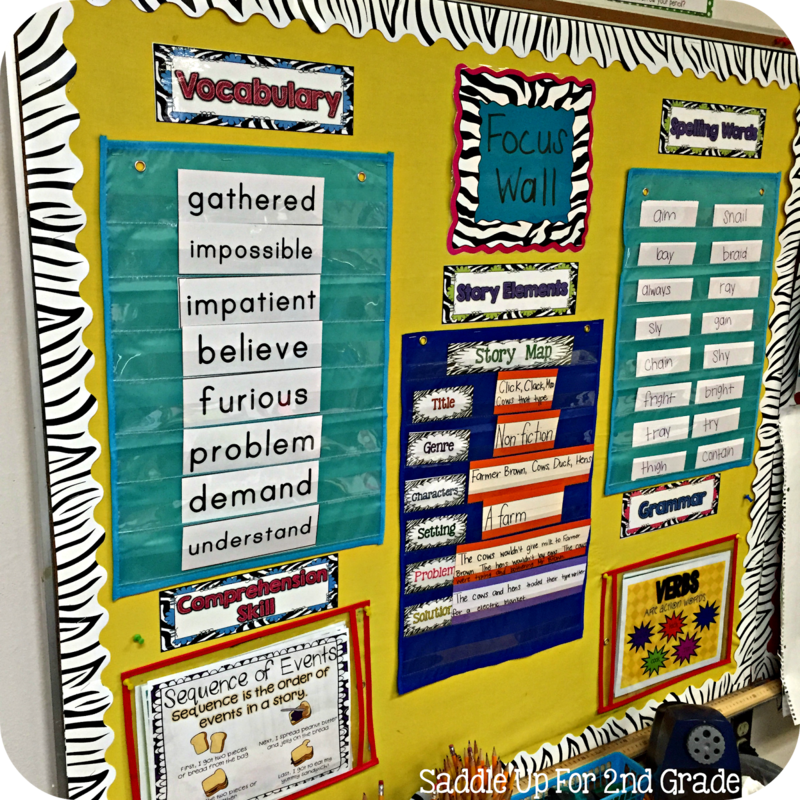 Weekly vocabulary words: Our weekly words and displayed so they can easily be seen from our small group table. I can easily access these cards during small groups when I need them. I don’t display the definitions only because that is my personal preference. I have my students create their own definitions when we are talking about the meaning of each word. You could easily display definitions if you’d like. Weekly comprehension skill: I display the comprehension skill we are working on in plastic page protectors. I can easily slide an anchor chart and we are ready to go. Story Elements: This is another personal preference. We work on story elements weekly throughout the year on various stories in small groups. After discussing, they are displayed on our board. At the beginning of the year, I write on the sentence strips that will be displayed. Once students are comfortable, I’ll assign a different element to a student during small groups for them to complete. Weekly spelling words: To display our spelling words, I use index cards and cut them in half to write the words on each week. Again, I can easily pull the cards during small groups when needed. I use them a lot in my small group warm ups. I might have a group put the cards in ABC order or sort the words by syllables of number of letters. This makes the wall interactive and teaches the kids that they can access the information at anytime. Weekly grammar skill: I normally spend two weeks (or more) teaching a particular grammar skill. I display another anchor chart in a plastic sleeve for easy access. At the time the photo was taken, we were working on verbs, if someone forgot what a verb was, I could easily direct them to our focus wall to find the answer. The skills listed above were all I had room for. How to keep up with a focus wall? Keep it SIMPLE! I use the pocket charts and plastic sleeves so that I can easily change things when needed. My weekly vocabulary words are kept in a file folder and organized by story. I pull them each week and quickly change them out. For spelling, I used index cards that are cut in half. I write them as I’m introducing them each week. I also store these in a file folder and they are organized by week. As for my story element board, I keep sentence strips from Dollar Tree on hand at all times. I cut them in half or into pieces to make them smaller to save space on our chart. My comprehension and grammar skills are displayed in clear plastic sleeves (I don’t always have time to laminate them so it is great to have them protected). Each week, I place our new skill over the old one so that all my anchor charts are in one place and I can easily access them when needed again. This saves me so much time. It takes me about 5 minutes to change out and set up our focus wall for the week. 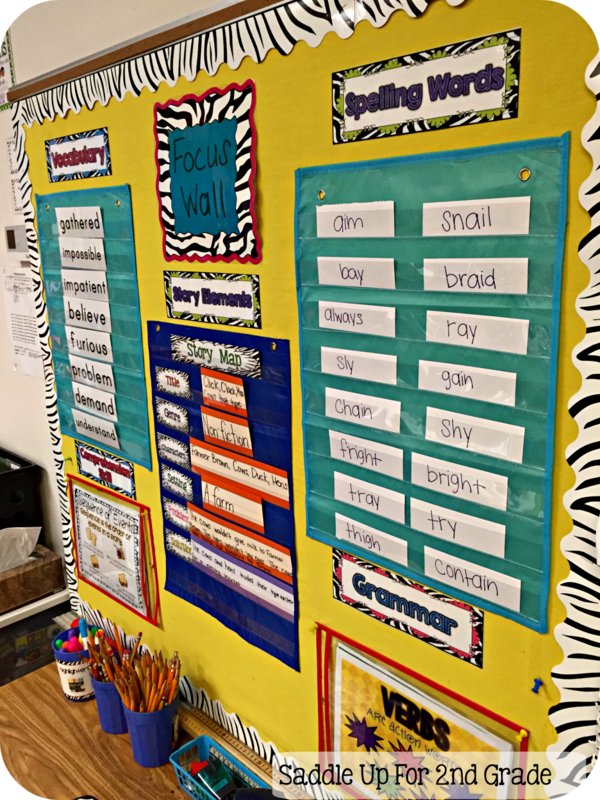 Do you want to get a focus wall started in your classroom? Grab these headers in bright colors here! 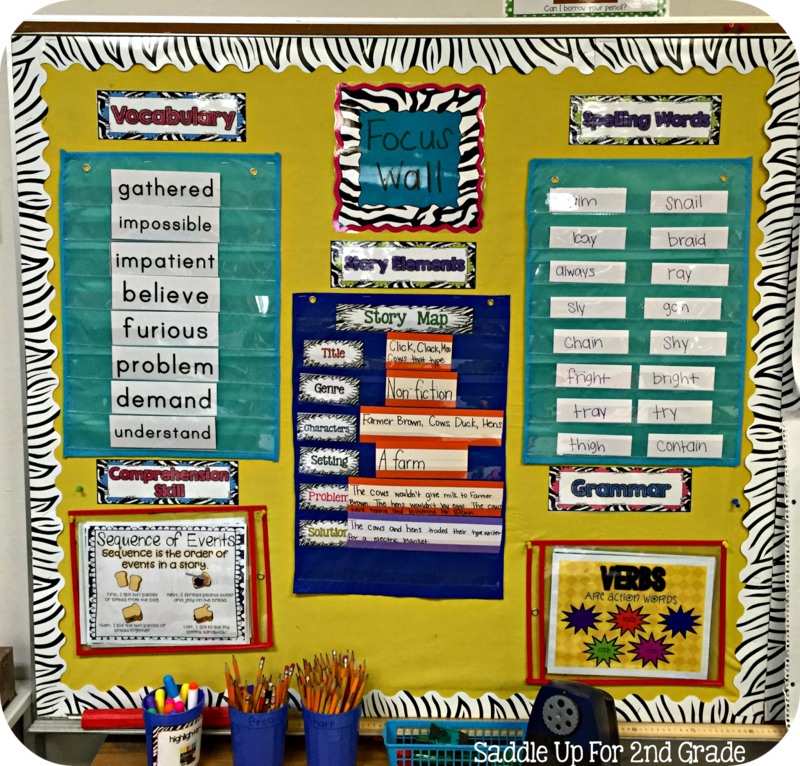 They are just like mine shown above but with a white background instead of zebra print so that you can easily use them in YOUR classroom. 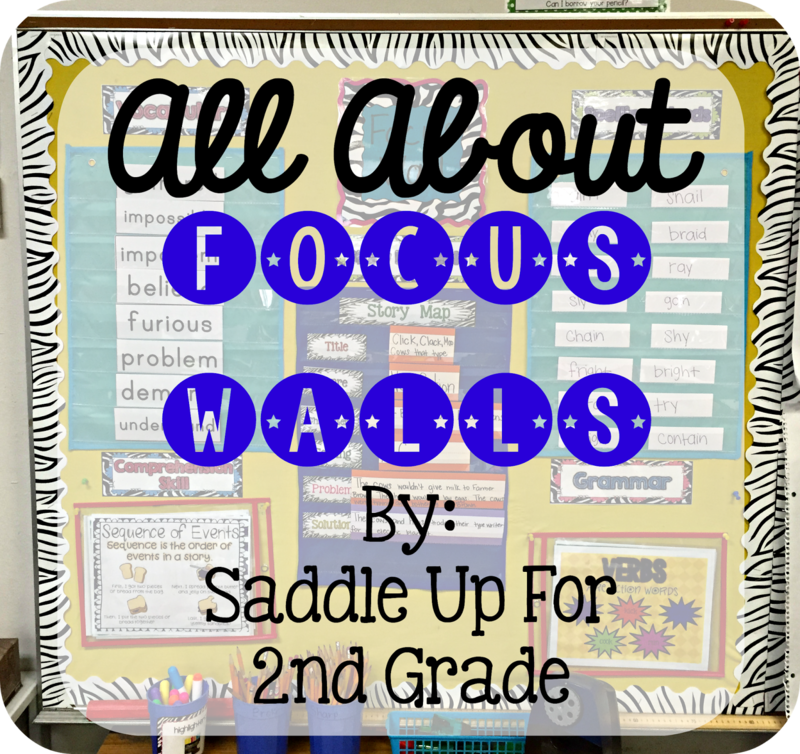 I hope this post gave you a better idea about focus walls and how to implement them into your classroom. If you have any other questions just leave me a comment below and I’ll get back to you. I’d love to hear from you!